❉This easy to set up weatherproof bed requires no laborious installation and folds out to offer up to 4 square feet of gardening space that lasts for years. ❉It warms quickly in the Spring, releases excessive heat in the Summer, and provides good drainage all year long. The plant bed also air prunes roots while protecting plants from underground pests like gophers and moles. ❉Setting up a raised bed garden can be time consuming, back breaking and expensive. The bed is simple to set up, with no installation required. Just unfold, fill and plant! Raised bed kits or purchasing lumber to create a raised bed can cost hundreds of dollars, plus you have to install it. The plant bed is very inexpensive and also reusable. Expect at least 1-3 years use with the plant bed. ❉The plant bed is constructed from the same porous fabric as Smart Pots. This material dissipates excess heat and encourages excess water to evaporate. ❉The fabric has a unique ability to air prune the roots, enhancing the plants' ability to create strong healthy roots. As roots grow they soon reach the container walls causing the roots to air prune, which also causes a natural, fibrous root structure. ❉This Eco-friendly raised bed provides a simple solution to anywhere gardening. Use them on the patio, in the backyard, in the sun room, or on the roof! Let your creativity loose and garden wherever your heart desires! Tips：Because they are felt material,in order to stay up be more perfect,you can some kind of a frame to help hold them up. ✭ Made of a fabric material, a highly durable, UV resistant, non-woven fabric that provides exceptional air flow throughout the soil and root systems and allows excess moisture to easily drain away.Tips：Because they are felt material,in order to stay up be more perfect,you can some kind of a frame to help hold them up. ✭ Quickeasy to setup, relocate, wash and store for future use. Reusable containers durable enough for many seasons use. ✭ Easy to use: unfold, fill and grow; Ideal for an herb garden, small flower garden or vegetables. ✭ Warms quickly in the spring, releases excess heat in the summer and provides excellent drainage for healthy plants. 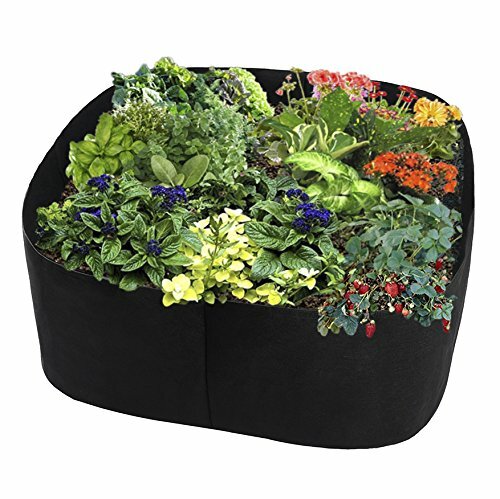 ✭ Instant fabric soft raised garden bed for plants, flowers and fresh herbs, vegetables and fruit. Ready to go out of the box; No assembly required. If you have any questions about this product by Alapaste, contact us by completing and submitting the form below. If you are looking for a specif part number, please include it with your message. Greenes Fence Cedar Raised Garden Kit 2 Ft. X 4 Ft. X 10.5 In. Frame It All Two Inch Series Composite Tree Ring Kit, 10.5' x 5.5" x 2"